In a culture where sense gratification is the goal in life, children are seen as a burden and disturbance and are thus pushed aside into Day Care Centers and Kinder Gardens at a very young age. In spiritual culture children are moved into the very center of life, and they are given special care, affection and attention since they are known to build the future of society. Thus being a parent is seen as a great responsibility and most valuable service and contribution to human society, which is immensely purifying and uplifting if performed with sincerity in Krsna consciousness. Let us remember: The advancement of a society can be measured in how much its people do for their children! 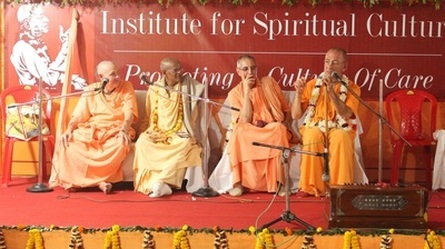 And we do have a lot of room to improve in this regard in order to make our ISKCON society solid and strong. As the saying goes: It takes a village to raise a child ! To receive deeper insights into important aspects of raising children within spiritual life is not only relevant for parents, but for anybody who wants to make a contribution in order to bring about a future generation of empowered Vaisnavas! What are the secrets of success in order to invite an empowered and advanced living entity to appear in our family? What are the underlying principles of parenting within spiritual culture? On this program we will find some answers to these questions and gain insights into the importance of systematic training and education in order to become a good parent. The Glories of our Vaikuntha Children...!